Beautiful white slabs, with wispy grey veining. Teltos Bianco Stella Quartz (2 CM) Installed at $39/per square foot for your kitchen! With its white sparkling look, Bianco Stella will look stunning in any modern or traditional kitchen. Discounted Slabs For Single Slab Kitchens! Installed kitchens, starting at $39/per sq. ft. DEEPLY DISCOUNTED REMNANTS INSTALLED FOR $35 PER SQ. 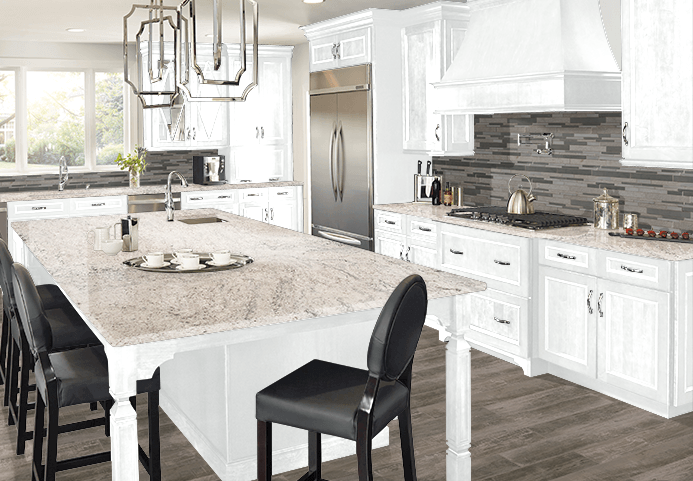 FT.
Over eight thousand square feet of natural stone and engineered quartz remnants, now available at one low price! Stop in today with your measurements and a Design Associate will be happy to assist you with selecting your next vanity, laundry room, kitchen island, fireplace hearth, or outdoor BBQ countertops. bLANCO CACHEIRO REMNANT SELECTED FROM OUR WAREHOUSE! FREE 16 Gauge Stainless Undermount Sink! Available in customer's choice of style (valued at $350) with your next purchase of 3CM Granite and/or Quartz kitchen countertops! Free sink promo is included with Tier Two (and above). Certain restrictions may apply. Promotions cannot be combined. Only one promotion per project.